In a few short months, Emi’s mortal life will end when she becomes the human host of an immortal goddess. Carefully hidden from those who would destroy her, she has prepared her mind, body, and soul to unite with the goddess—and not once has she doubted her chosen fate. Shiro is a spirit of the earth and an enemy of the goddess Emi will soon host. Mystery shrouds his every move and his ruby eyes shine with cunning she can’t match and dares not trust. But she saved his life, and until his debt is paid, he is hers to command—whether she wants him or not. On the day they meet, everything Emi believes comes undone, swept away like snow upon the winter wind. For the first time, she wants to change her fate—but how can she erase a destiny already wrought in stone? Against the power of the gods, Shiro is her only hope … and hope is all she has left. RED WINTER includes 10 full-page illustrations by award-winning artist Brittany Jackson. – Japanese mythology. Maybe it’s just me, but there don’t seem to be that many Japanese mythology books out there. I mean, sure, I could read about dragons and wyverns all day long. I love paranormal creatures, but vampires and werewolves are everywhere. And most of us probably learned a thing or two about Greek mythology from Rick Riordan. But Japanese mythology? Give me more! The creatures in this book are so intriguing and magical and new and lovely and I am so researching more about them because I can’t get enough. – Glorious worldbuilding. Going further on the mythology aspect, the world in this book is so beautifully written and so much thought has gone into the development. To be fair, the first 20% or so is pretty dense. There is a lot of information to process, a lot of names to learn and it might be a little complex and intimidating at first. But please trust me, it is so worth it. Once you are completely immersed in the world, you’ll never want to leave it. Also, it does help that there is a handy glossary at the end and the ebook even has links to images to help you visualize. – Gorgeous illustrations. Talking about visualizing, Red Winter also includes 10 absolutely gorgeous full-page illustrations by Brittany Jackson. Not only are they heart-stoppingly beautiful, they also really help visualize the scenes and characters vividly. – Emi. She’s definitely not your average fantasy heroine. When she was 8 years old, she was marked by Amaterasu, the goddess who will use Emi as a vessel to walk on earth. This moment is what Emi has been training and working her whole life towards and it is almost here. However, it means that she has been very sheltered and is lonely. She may not have great physical strength, but she is filled with so much kindness and courage and it makes her a great protagonist. She learns so much throughout the book and goes through so much character development. Though she is saved by others quite often, she spends about as much time saving them right back and is a force to be reckoned with in her own right. – Shiro. Our main hero may not be your traditional hero. He’s a kitsune, a mischievous fox-spirit, who has been cursed and can’t remember anything about his past or even his real name. When Emi saves him, he is in her debt and that’s really when the story takes off. He’s a great character, one who you’re not completely certain you can trust, someone who is unpredictable and cunning and mysterious and just that perfect bit of morally grey. Oh, and he’s also a big, unapologetic flirt. – Action. So much action! Okay, the first 20% or so is pretty information-heavy. But once past that mark, once Emi and Shiro meet, this is one huge, epic adventure with perfect pacing. It was a thrill to go on these adventures with Emi and Shiro, meet all these amazing characters (I love Yumei) and fantastical creatures and learn more about the world. It’s a whirlwind ride that’s pretty hard to put down once you started. – Romance. How can there still be room for romance when there is already so much worldbuilding and action going on? Well, yes, it’s pretty much on the down-low in this first book. But the chemistry for an amazing slow-burn romance is there and every single scene between these two characters is sizzling and I can see them going down in history as one of my beloved OTP’s. No insta-love here, but the best slow-burn you can imagine. Also, though there are a few hints, no love triangle! Overall, I am so happy I found this little hidden gem. I found myself not only a new fantasy world to fall in love with, but also some new and memorable characters to adore. After finishing this book, I had to dive immediately into book two, Dark Tempest, and let me tell you: it only gets better. I’ll be eagerly awaiting the third and final part in this trilogy and will definitely keep an eye out for more books by Annette Marie. 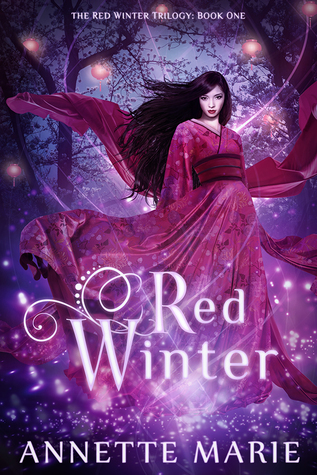 Have you read Red Winter? What did you think about it? Wow – This is a new one for me and I love that you loved it so much! It sounds really interesting and those illustrations are simply gorgeous. Also I love the quotes you shared! I’m going to have to look at this one in far more detail. I absolutely adored this one so I’m happy it sounds interesting to you 🙂 Hope you’ll enjoy it if you pick it up! This does sound good! I love fantasy, but haven’t read much Japanese mythology (although I do have a thing for Japanese horror, which is based on some darker myths). Oh, I don’t know about Japanese Horror, but I do love the mythology in this fantasy 🙂 Definitely worth looking further into! Haha, the word kitsune is also what caused me to pick this one up and it did not disappoint 😉 I’m glad this sounds interesting to you too and I hope you’ll enjoy it when you get a chance to read it! I’m so glad you enjoyed this book because I adored it too. 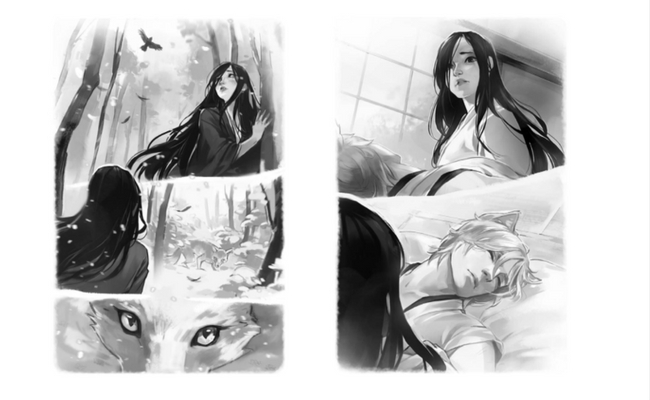 Everything I love has been rolled into this story… Japan, Mythology, Romance, Fantasy! I thought the second one was just as amazing too but now I can’t wait for book three! I needs it now! Great review!! Yes, I loved this so much! I read the second book immediately after finishing this one and I thought it was even better if possible 😉 I’m so looking forward to the third book as well!